You might think it was as early as 1998 or at least 2008 when video killed radio, but that was just injury, not death. Radio ads had waning health and overacting sure, but they were holding on to that work commute, monthly manicure, or baby boomer anniversary for exposure. This year, mobile video usage has increased by nearly 10 million daily viewing minutes in the past two years. We’re binging on video like never before. Brands can put an ad in mailbox or an inbox and hope someone notices, but they’d be better off focusing on the box in our hands, where we play 90% of all video play, our phones! Brands need to put antiquated boxes like inbox, mail box, and banner ads and opt for out of the box writers who can write marketing scripts FOR videos. This is the present and this is the future! Indeed, 70% of YouTube viewers watch videos for “help with a problem” they’re having in their hobby, job, studies, or relationship. When you’re a brand offering a product as a solution to a problem, this statistic should be a screaming siren. You can be the source, the authority, the support to whatever question they’re asking. Every brand’s product answers someone question and those questions are all being asked on YouTube. Even disability insurance lawyers have video marketing content with an informative bent for those searching for it. Merely using the word “video” in an email subject line boosts open rates by 19% and click-through rates by 65%! So hold onto that email inbox but ADD video marketing to it. In the iconic TV series Breaking Bad, antagonists love to send a message with a memorable visual: a severed head on a walking turtle, for instance. Instinctively, these criminals know that the threat stays with someone longer if it has a morbid, strange image associated with it. It is statistically true that when people hear new information, they retain only 10% three days later. But if the same information is paired with a relevant image or marketing video, they retain 65% of it three days later. Thus, the DEA certainly remembers any informant who got killed in action, but they’ll especially retain the guilt, fear, and anguish after seeing an informant’s head on a turtle. So, videos are not only valuable because of the exposure potential, but the psychological effect. The Best Video Content Has A Plan, Blueprint, SCRIPT! Unfortunately, just making a video by throwing visuals on the wall and hoping they stick doesn’t cut it. The best video content had a plan, a blueprint, a script. Even if it’s how-to video, especially if it’s a how-to video, a writer organizes the visuals in a shot list and writes a shooting script. Now, while shooting, new ideas may crop up and the script may be revised live, but there’s gotta be planning or production will eat up hour after hour of time. Moreover, setting up the camera and lighting your subjects takes time and ideas cannot be spur of the moment. Even or a minute-long video, planning and storytelling are necessary. The other reason it’s very important to write a marketing script is so there’s a physical detailed plan to show higher-ups before shooting so that you don’t waste your time shooting footage you won’t even use. Editing script takes less time than editing and often reshooting replacement video. Further, it’s important to run your plan by as many people as possible to prevent video backlash. For example, when Dove released a video of multi-racial women bathing, there was huge backlash about the style of editing where a black woman transformed into a white woman while wiping her face with white soap. What may have been in a script and what may have seemed like a simple video editing transition turned into a tarnished brand name. So, getting eyes on work in the earlier stages may prevent these kind of unfortunate incidents. Don’t fall into the trap of creating typical gimmicky video that’re forced and forgettable, otherwise it will be as corny as those dead radio ads. 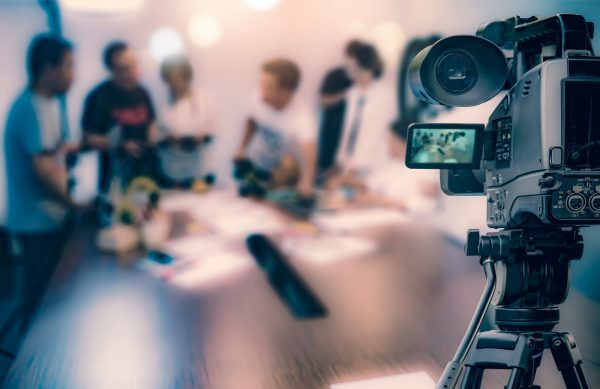 If you think creating a video means imitating the status quo, your video will find a home amongst the other basic, typical, average, mediocre content at the bottom of the pool. You need to hire a creative writer, not a business-trend imitator. Remember, all cliches used to be original. Repeating cliches instead of taking a risk with original material is the worst mistake you can make. Your brand needs well-written scripts and shot lists created by a writer with an eye for visuals and experience in video editing and social media marketing. The best videos start with the best scripts, and the best scripts are written by the best writers. The best writers congregate at Writer Access, where you can find a niche-based writer, a video-production writer, or a storyteller with video editing experience ALL in ONE spot.